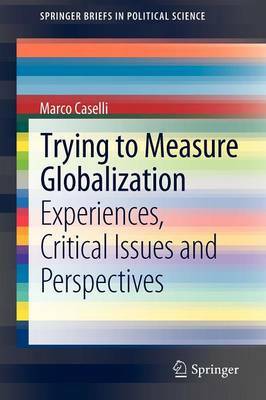 The aim of this book is to conduct a critical survey of the main tools devised for the synthetic measurement of globalization processes. To this end, the first part of the book discusses the meaning of the concept considered, highlighting the different and often contradictory interpretations put forward in its regard in the literature. Subsequently analysed are the passages and issues that must be addressed when constructing an instrument intended to measure a social phenomenon of such complexity as globalization. Stressed in particular is that the researcher's subjectivity is repeatedly involved in these passages, so that no instrument can have objective validity. Given these premises, the book presents the principal tools employed in attempts to measure globalization, starting with those whose unit of analysis is the state. In this regard, particular space is devoted to indexes which take a multidimensional approach to the concept of globalization. There follows a comparison among the results obtained using these indexes, and criticisms are made of the ways in which the latter have been constructed. A limitation, or if one wishes a paradox, concerning such tools is that they measure in relation to states a process which has as one of its principal features the fact that it extends beyond the confines of states. For this reason, the final chapter considers whether globalization can be measured with different units of analysis - in particular people and cities. The books concludes with discussion of the general limitations of globalization indexes.